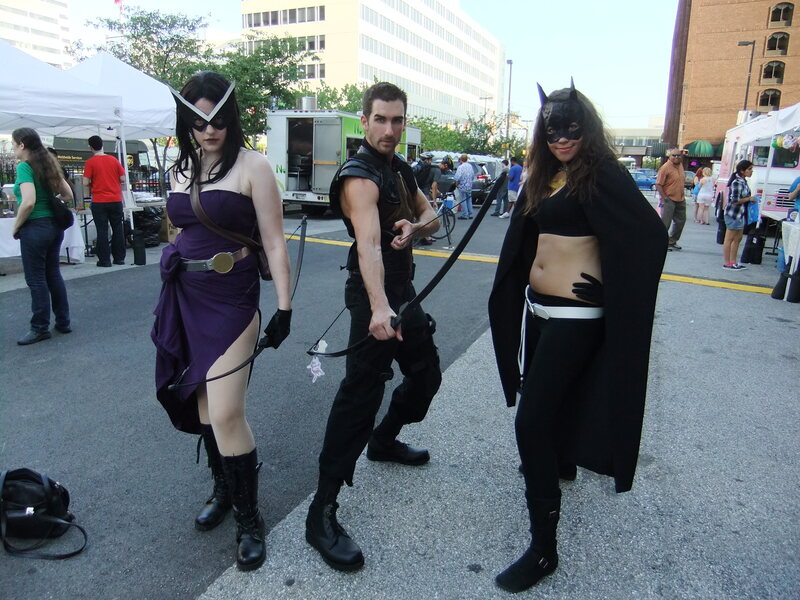 The Otakon Matsuri on Thursday is a spectacular success despite temperatures hovering around a hundred the entire time. The deadly* heat prompted Brent** to proclaim it as “Swampass Con”. Held in the parking lot of the First Mariner Arena, my first impression found it small in every sense. Expectations for a matsuri that one encounters in anime are certainly unreasonable but I had hoped otherwise. There were only three food vendors which would be ok had they featured Japanese cuisine but instead offered pork, Pho and noodles. Besides, the prices were not exactly appetizing. It’s understandable that choices among food trucks or those with mobility would be limited and pricy. The booth that had not one, but two, bottles of water for $1 was a definite win however. Performers’ booths rounded out the rest. In short, not much to do or see. The music overwhelmingly overshadowed all of the above. I was familiar with none of the bands beforehand but ended the day with two very happy discoveries. Prior to their performance, drummers from the Chin Hamaya Culture Center engaged the crowd by offering anyone a chance to play the drum. I am very confident that my drumming, or more accurately, lack of drumming, sorely disappointed the boy that approached me. I know this because in a few minutes I got to witness him and the rest of his troupe drum and march their way into my heart. Kelly, their leader, who is a joy to speak with, introduced each instrument along with background on origins and the like which the reader may peruse at the end of this article. I would write love letters to demonstrate their amazing performance but I captured some on video so do yourself a favor and see what you missed out on. The Culture Center is based in the Washington DC metro so if you’re in the area, I highly recommend catching one of their shows. I know I will. 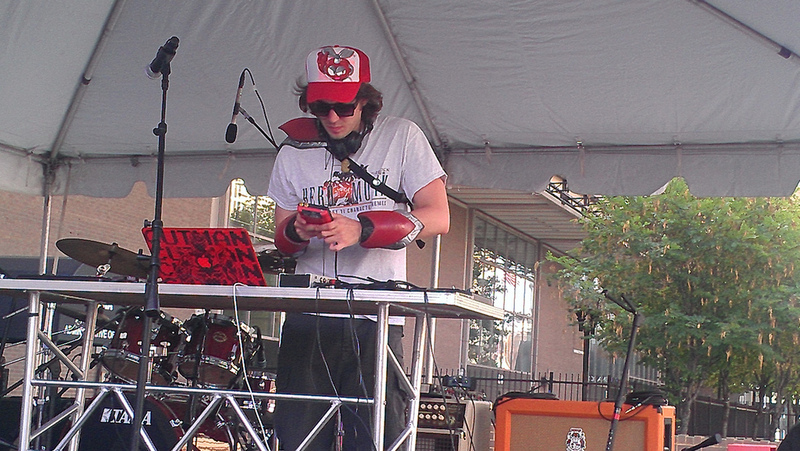 just after the Taiko drums ended so I missed DJ Cutman’s first mini set but was back in time for Shinsei. Their performance was solid but nothing to write home about. The reader may judge for themselves here. Highlights for me include the bass player who reminds me of the guy from Nana who also wears a chain linking ear and lip and the guitar player who broke at least two picks. I should also mention that they had a guest drummer that alternated between songs. DJ Cutman had another mini set. I am picky with my rave music, hence my early exits at the Otakurave each year, but I found myself nodding along for the majority of the set. He had an adapter that connected his Game Boy for some chip tunes at one point. My favorite part was the flawless transition into “Call Me Maybe”. It was subtle and well played. Finally, we were treated to Hsu-nami. You know it’s going to rock when there’s an erhu involved. And no, I did not know what it was at the time. I had to ask Jack, who plays said instrument, how he kept the bow string from breaking to which he revealed that he has never broken the string which astounded me because he played with a ferocity that kept the string stretched practically the entire time. Run, don’t walk, to the video. While cute at first, Brent’s insistence on rousing the crowd got old given that the music spoke much more convincingly. Actually, the music roared. I was delighted by the showmanship of Jack who often held the erhu like an extension of himself where he released all his emotions. I was too busy dancing to record the part where a brief duet took place between him and the keyboard to my chagrin. Hsu-nami demonstrated superb synergy among the instruments. There were definite moments where it sounded like an erhu concerto with band but on the whole, each sound complimented each other like long time friends conversing, well, dancing around a table. 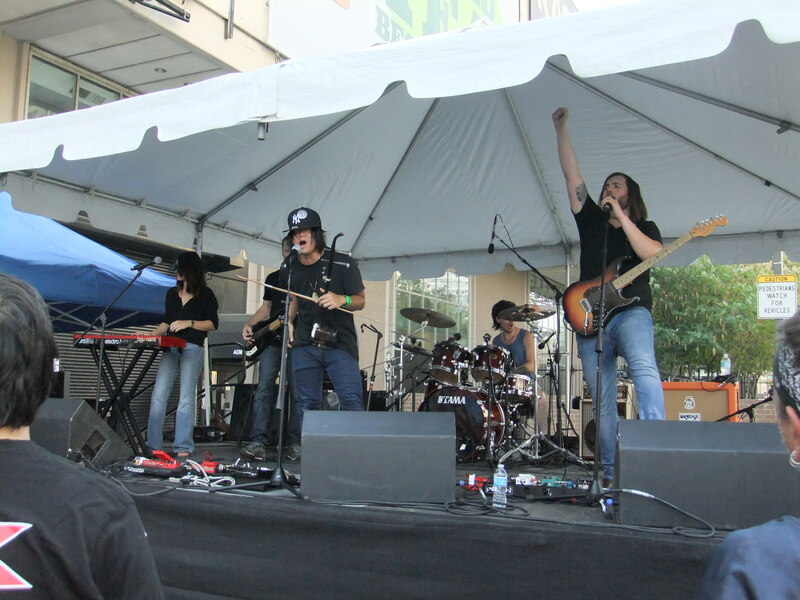 The set was a fantastic ending to the Matsuri. I felt it set an upbeat tone for the rest of the con. It’s the one being held up. The Paranku is a small hand-held drum with a cow skin frame drum which is used in traditional events called “Eisa”. Eisa is a form of folk dance unique to the people of the Ryukyu Islands. 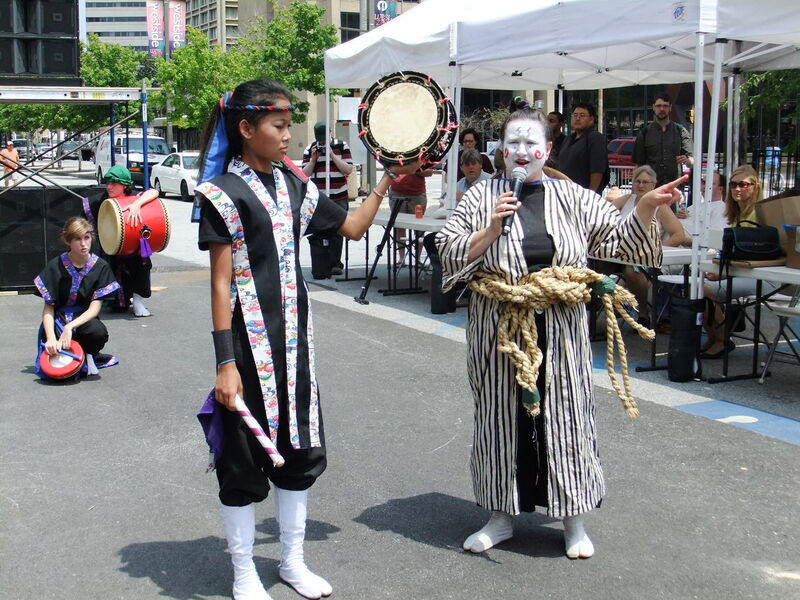 This is a centuries-long tradition, to mark the end of the Obon Festival. Eisa is an event which young people play paranku/other kind of drums and dance with the song and the musical band to send off the ancestor soul to another world. 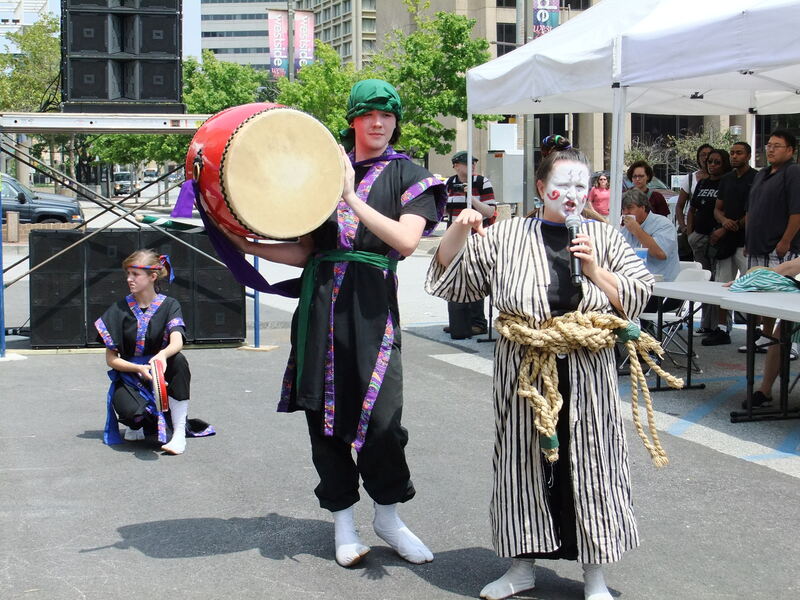 O’Daiko drums are the largest members of the family of drums. 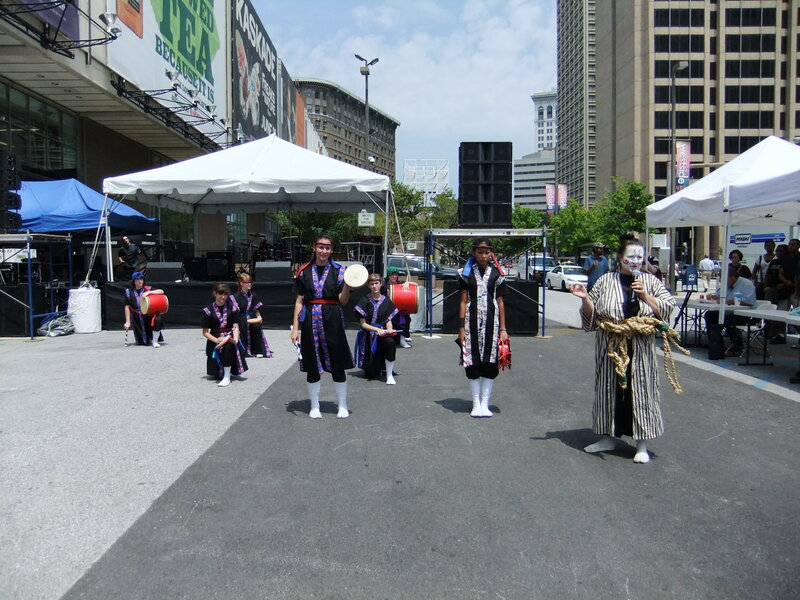 Because an o-daiko is made from a single tree trunk, the trees from which they come can be hundreds of years old and the largest of them come from trees over a thousand years old. 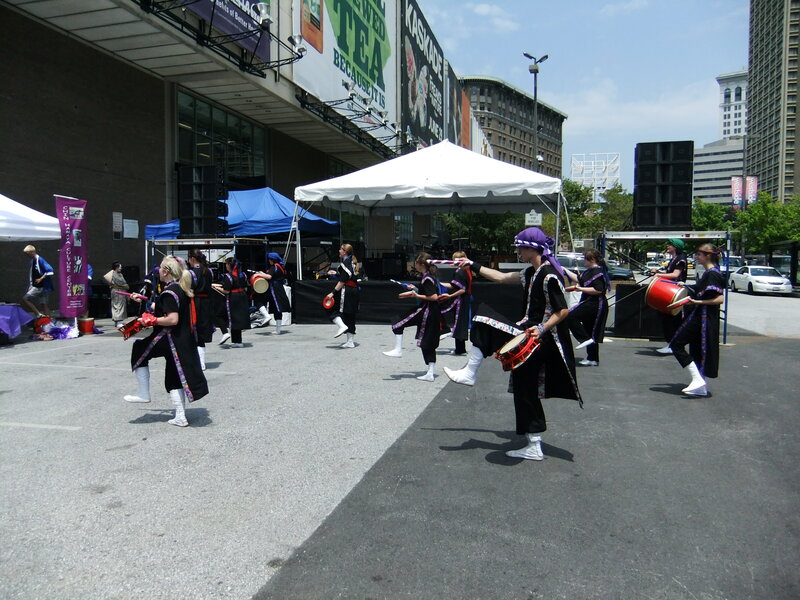 Shime Daiko is a major category of drums that have their drumheads pulled taut over a hoop by a lace of tension cords. The word “shime” comes from the verb “shimeru”, meaning to bind or make tight. Adjustments to their tone are made by pulling the cords. 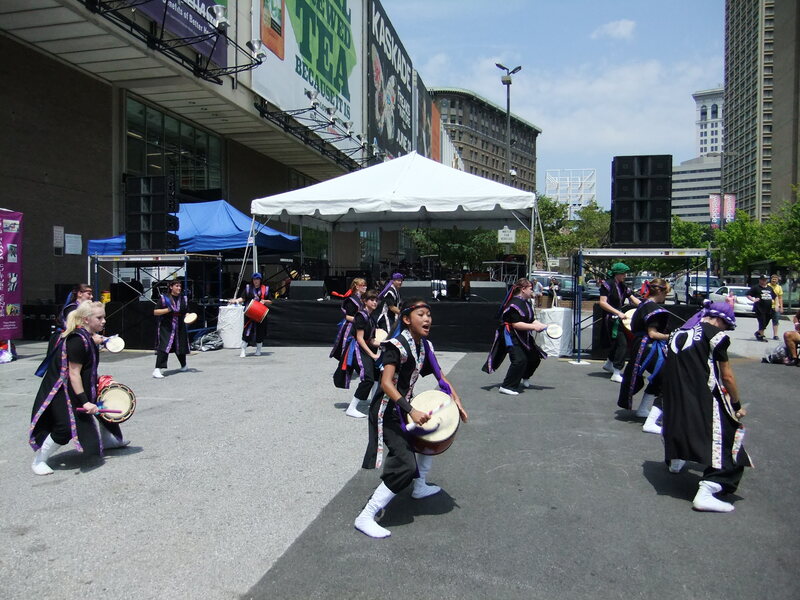 Shime-daiko are drums that can be tuned. * Linda, one of our correspondents, got sick from the heat :/ She is better now. 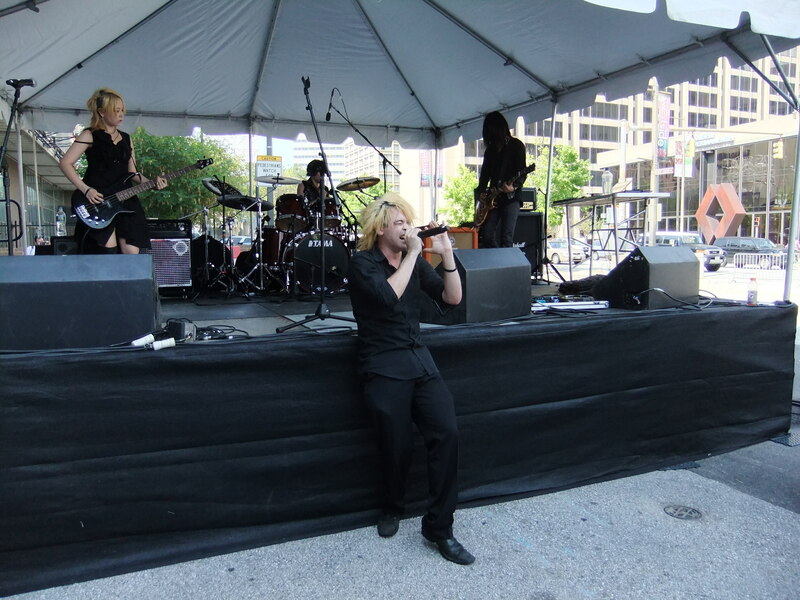 ** Brent is the guitarist for Hsu-nami.